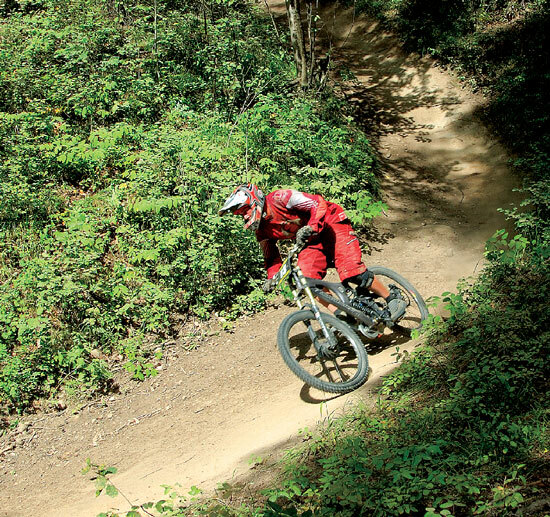 The mountain biking trail systems of the Golden area are as diverse as the area’s geography. From adrenaline-filled downhill to rolling cross-country trails, the area has something for bikers of all types. Mount 7, just outside Golden has some of the best downhill trails in western Canada and is home to the internationally famous Psychosis bike race. This race, held every July, is billed as the world’s most demented downhill race. Don’t let that hold you back; this particular trail system has something for everyone. Steeps and drops to buttery single-track are all well worth the experience. Stunts and various natural obstacles are mixed into the unique forested terrain. Check out trails 5 km and 10 km or B-12 for the more advanced. Snake hill, at the bottom of the mountain,is a fun, winding gully, which adds great flow to the end of a long descent. The system starts at the paraglider launch, which is accessible by a logging road (4×4 recommended). Across the Columbia River Valley is Kicking Horse Mountain Resort, which contains 27 downhill trails, all of which are accessible by a high-speed gondola. Trails range from alpine single track and rock slab to machine built, with jumps and nice bermed corners. You will also find a dirt jump park and various wooden stunts throughout. 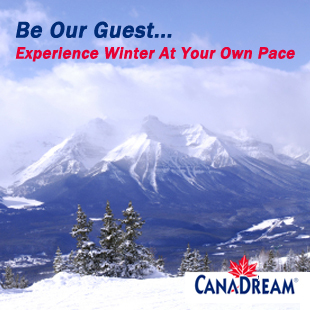 The resort’s season runs from mid June to early October. Rentals and accommodations are available. 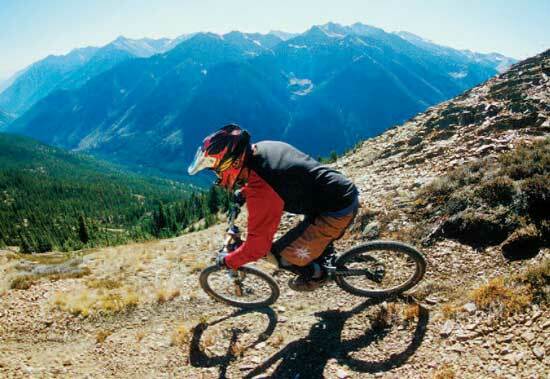 The Moonraker trails are located on the west bench of the Columbia Valley near the resort. These are world-class, cross-country trails and not to be missed. You can start in the town of Nicholson if you don’t mind a long uphill climb. Other access options include Cedar Lake and Saunders Lake. These trails are generally rolling single track with some old roads thrown into the mix. The Columbian mixed-forest is dotted with small lakes, creeks, and gullies. Northstar and Bear Claw are great trails with Canyon Creek being the signature route down. It follows the edge of a deep canyon and is simply breathtaking. Single track at the top gives way to a wider trail that used to be a mule track for early prospectors. Mountain Goats can be seen on some of the cliffs in the canyon. The Golden Cycling Club maintains many of these trails, and membership includes riding insurance. They also have a great trail map, which is available at various bike shops in Golden. 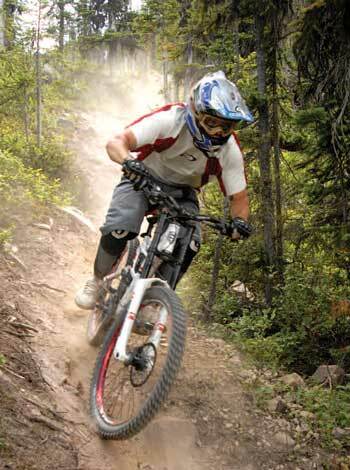 It is highly recommended that a full suspension bike and body armour be used on the downhill trails. Some of the cross-country trails are multi-purpose; watch out for hikers, horses, and ATVs. Enjoy the trails!